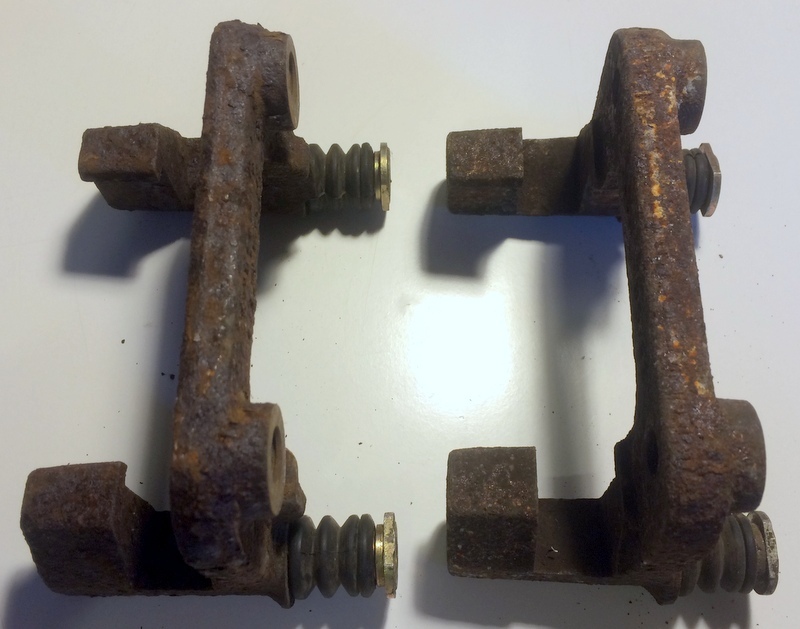 You are looking at a used set of left and right rear brake caliper mounting brackets from a 1998 Ford Mustang GT with rear disc brakes. These parts bolt to the rear axle housing brackets and hold the rear calipers via a set of sliding pins. 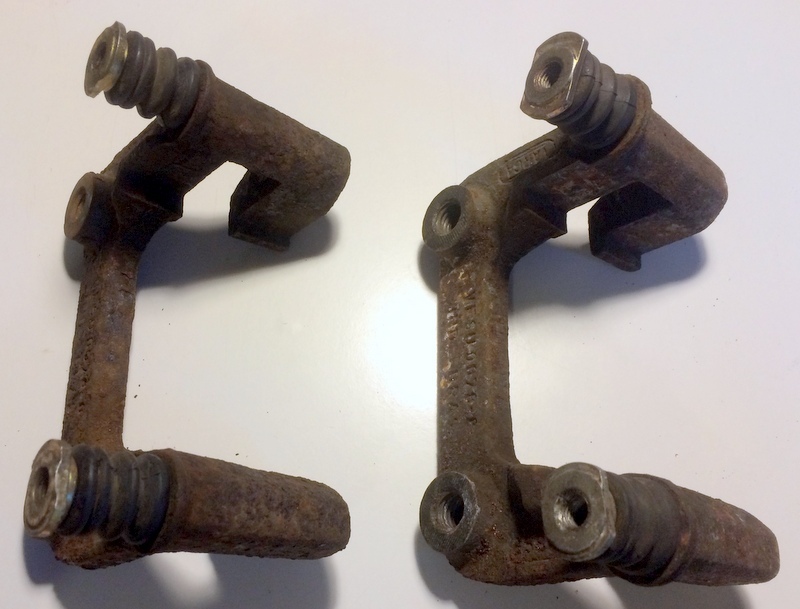 The part number stampings are illegible, but these were remanufactured units purchased from Advance Auto Parts, and correspond to Cardone part #141028. The brackets are interchangeable from the left side to the right side. The brackets are in acceptable shape cosmetically, and excellent shape functionally. They had roughly 30,000 miles of use when pulled. Sliding pins and boots are included and are in good shape, although you will want to clean and re-grease the sliding pins before re-installation. 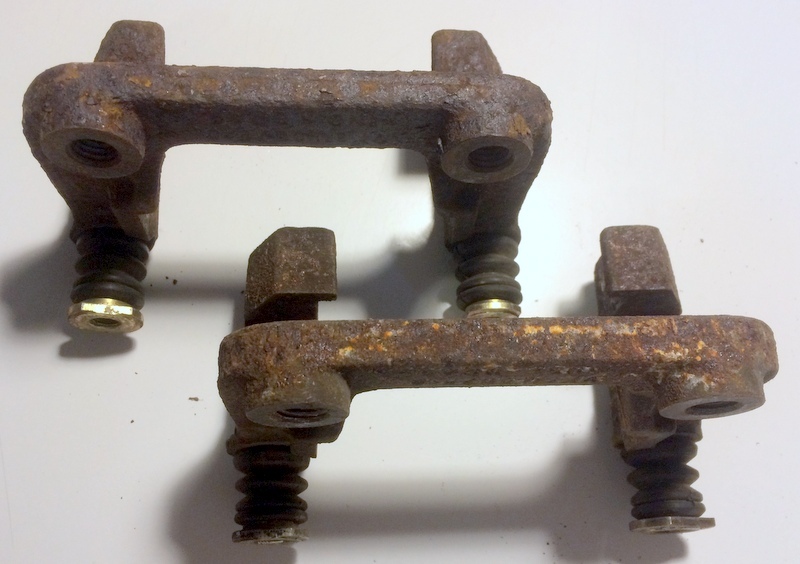 The threads on both the sliding pins and the body of the brackets themselves are in fine shape and ready to receive bolts. The brackets are not cracked, bent, or otherwise damaged in any way. 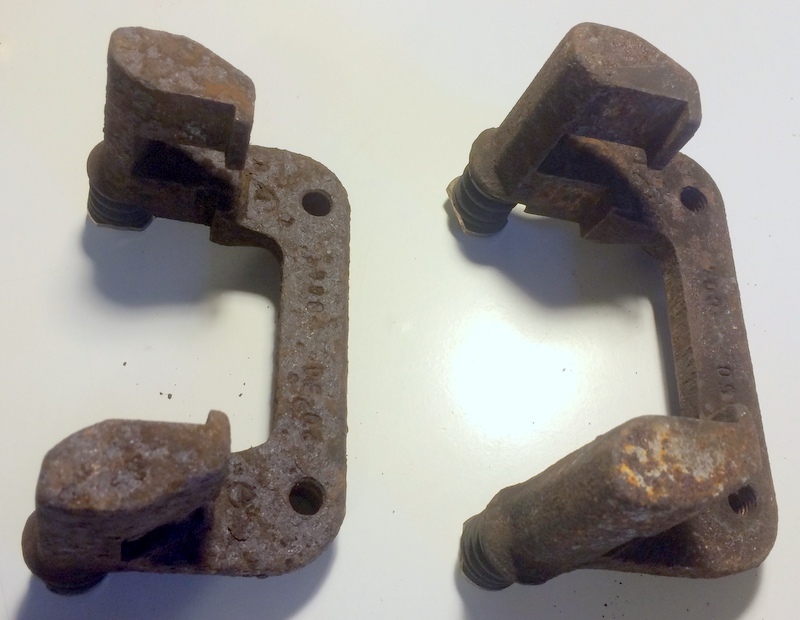 There is a significant degree of surface rust on the body of the brackets, but this is cosmetic only and does not affect operation. Nevertheless, you may wish to clean up the brackets and/or paint them before installation. When I purchased them, they were bare metal. These parts are listed to fit the 1994-2004 Ford Mustang GT with rear disc brakes, or any vehicle (such as an earlier Mustang or a Ford Ranger) being converted to this brake setup. They may work for other years and models as well. Please not that the Cobra rear disc brakes, or vehicles being converted to a Cobra rear disc brake setup, will require different brackets; these will not work in that application. Please check compatibility with a dealer, parts store, or other reliable source. $20 local pickup in State College, PA, $30 shipped anywhere in the United States, or best reasonable offer. International shipping available for an additional charge depending on destination. Last edited by CADreamin; 07-22-2016 at 08:53 AM. Bump...price drop...$20 local pickup in State College, PA, $30 shipped anywhere in the United States, or best reasonable offer. International shipping available for an additional charge depending on destination. Bump...price drop...$15 local pickup in State College, PA, $25 shipped anywhere in the United States, or best reasonable offer. International shipping available for an additional charge depending on destination.